Unlike his neighbors east and west of him, Gaddafi has vowed to fight till the bitter end. He will not willingly relinquish power at the price of an ongoing civil war and of the practical division of Libya into two sub-areas: Tripolitania and Cyrenaica, historically the two vilayets (departments) constituting Libya under Ottoman rule. Much has been written and said about Gaddafi, the tribal structure of Libya, the social background of the popular upheaval, the possibility of foreign military intervention to oust Gaddafi, a leader “unfit” to govern his country, the mounting prices of oil, and the humanitarian crisis at the Tunisian border. 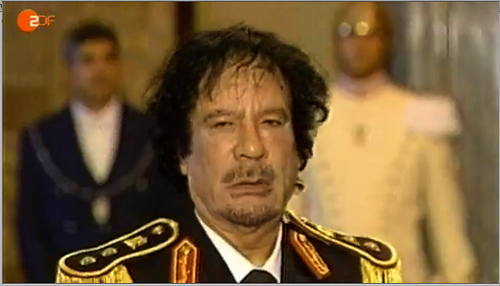 The Western world has united in condemning Gaddafi, is pressuring him to resign, has treated him as a pariah and threatened him, and vowed to try him at The Hague tribunal for crimes against Humanity. One thing is clear now for all: the Gaddafi of today is in many ways the reflection of what he was in his prime: a ruthless, foxy, heartless, arch-terrorist who blew up the La Belle Discotheque in Berlin and Pan Am Flight 103 at Lockerbie, the man who invaded Chad and funded many terrorist groups who brought death and destruction wherever they were active. The only mistake of the West was to believe that Gaddafi, having sacrificed two of his men (it seems from his own tribe) and paid compensation for his victims, had in fact changed and become a reasonable man ready to cooperate with the Western powers against the threat of al-Qaeda and against the proliferation of unconventional weapons of mass destruction. Was it a mistake or a wishful thinking? I tend to believe that the quest for lucrative contracts as well as the search for a steady flow of oil and gas to Europe and the U.S. was behind much of the condescendence of the West towards Gaddafi. What then is to become of Libya? Would Barack Obama dare and intervene militarily in Libya at a time when he is striving to disengage from Iraq and maybe Afghanistan? The recent events in the Ivory Coast, where elected President Ouattara is being openly and militarily defied by the loser at the polls, President Gbagbo, and where the two rivals have physically divided the main city, Abidjan, into two camps living side by side with a few blocks separating the two, lead us to assess that the Western world will not send forces to quell either Gaddafi or Gbagbo. The most extreme measures will be, most probably, imposing an embargo on weapons, freezing assets, imposing a no-fly zone, and imposing a naval and air siege on Libya (and the Ivory Coast). All this is in the hope that the domestic forces would be encouraged to confront the dictators and establish new regimes, preferably closer to the Western concept of democracy. To what extent will this “siege” apply to Libya? Would the West allow basic commodities to enter the country, specifically to Tripoli? Wouldn’t an extended siege create a humanitarian problem in Libya, such as the one the West claimed Israel had created with its siege of Gaza? If this assumption is correct, then Gaddafi is not going to disappear tomorrow. He might even be tempted to regain lost territory. Neither Gaddafi nor his opposition care right now if this process is time-consuming. Gaddafi is no hurry and the new “popular” government in Benghazi needs time to consolidate its power. In the meantime, Gaddafi and his son Saif el-Islam will continue the masquerade and display more acts of folly which will continue to amaze the world.